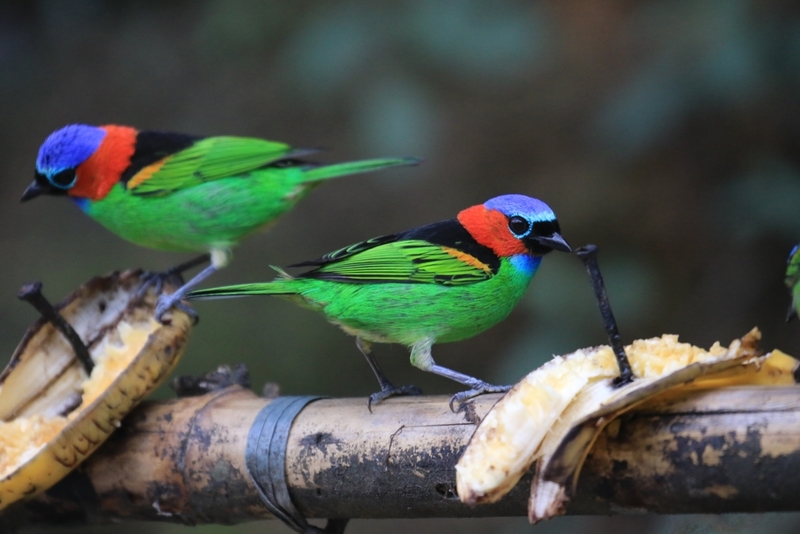 Want to see Atlantic rainforest endemics? Visitors coming to stay at REGUA can enjoy an excursion to Pico de Caledonia, a granite peak located just two hours drive from REGUA near Nova Friburgo. Atlantic rainforest endemic species can be found all along the cobbled road that climbs to 2230m above sea level. This is home of the ultra-rare Grey-winged Cotinga (Tijuca condita) found only on trees tops of this mountain range, but probably the eeriest call heard is that of the Black-and-Gold Cotinga (Tijuca atra) a high pitched lonely whistle mixing in the mist. You can see the Large-tailed Antshrike (Mackenziaena leachii) hopping in the undergrowth as it comes to investigate the visitor. As it reveals his speckled black plumage, it is well camouflaged for such a large bird. 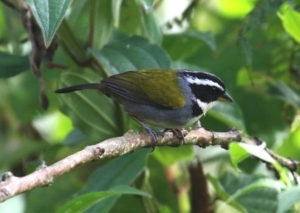 Another rare bird to be found in the area is the Serra do Mar Tyrant-Manakin (Neopelma chrysolophum). Whilst this species may not be as quite as flamboyant in colour as many of its Manakin ‘cousins’, its series of random short resonant notes and wonderful prominent yellow crest makes this yet another truly enigmatic species. The higher altitude of Pico de Caledonia is a marvellous place to visit all year round. However, during our summers when the lowlands can sometimes be hot and humid the altitude here brings a fresh and cooler feel. REGUA’s land, so it is great for us to be able to take our guests to a more readily accessible area. Caledonia hides many endemic residents but with patience and REGUA’s excellent bird guides they are all there to be seen. The Brazilian Anthrush (Chamaeza ruficauda) has also been known as Rufous-tailed Antthrush, it has also previously been confused with Cryptic Antthrush (C. meruloides) but the song differs. See here for further details. 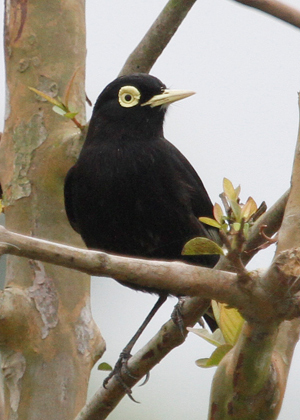 It is a relatively common bird locally, but a restricted-range species and can be difficult to locate until it sings. It occurs in protected areas, such as Serra dos Órgãos National Park, which is a lovely day trip out from REGUA. The call of this bird is an unmistakable ascending stanza that evokes the high altitude mist-laid forests which they inhabit. I was delighted to hear one calling recently at Macae de Cima and decided to follow it. After only a few minutes could I see an adult guarding the entrance of its nest, these being hollows in tree trunks which can be quite deep. Standing back and with a zoom lens I was able to get a photograph or two. Let’s hope they are successful in breeding their young and continue their guard of the forests. One of the species everyone anticipates on REGUA’s excursion to Mt Caledonia is the Half collared Sparrow, or Pectoral Sparrow (Arremon taciturnis). This stunning Sparrow is not an endemic to the Atlantic Rainforest for it occurs in the Amazon basin, but here in Rio state it can be seen only in the mountain regions of the Serra do Mar. Its typical high pitched “bis-bist” gives it away and play-back can draw it in. From then on, it flies quickly around the birder perching occasionally on an open branch to help the photographer. When that happens one can glimpse its exceptional colours and beauty – What a gem!! On 23 March, our bird guide Cirilo Vieira was guiding two guests David Wilcove and Tim Treuer from Princeton University at Pico da Caledônia who were keen to see the rare Grey-winged Cotinga Tijuca condita found in the elfin forest around the top of the mountain. Unfortunately they could only hear the cotinga calling, but then imagine their surprise when they caught sight of an Orange-breasted Falcon Falco deiroleucus perched on a bare branch close to the road (just a few hundred metres from the checkpoint at the start of of the starts to the summit). David had been looking for this bird for 30 years and sighed in disbelief when he realized what it was! Orange-breasted Falcon is very similar in appearance to the much more common and widespread Bat Falcon Falco rufigularis. Identification can be difficult, but there are some key identification features if seen well. Structurally, Orange-breasted Falcon is larger and bulkier than Bat Falcon and with a larger head and slightly shorter graduated tail. The feet are also noticeably larger and are yellow to greenish-yellow compared to the bright orange-yellow feet of Bat Falcon, and the bill is significantly heavier. Orange-breasted Falcon has blackish upperparts that contrast very little with the blackish head, whereas across much of it’s range, Bat Falcon generally has paler greyish upperparts that contrast with the blackish head. There are several supporting identification features, that while not diagnostic, are also useful. In Orange-breasted Falcon the white throat is bordered by an orange breast (above the black ‘vest’ on the belly) and neck sides, whereas in most Bat Falcons the white throat contrasts strongly with the black vest with little or no orange or buff on the breast (there are some exceptions though so this alone is not a reliable identification feature). Also, the whitish barring on the black vest is coarser with an orange wash on Orange-breasted Falcon compared to Bat Falcon that usually shows faint narrow whitish barring on the vest. The Neotropical Bird Club website has an excellent paper on the identification of Orange-breasted and Bat Falcons. 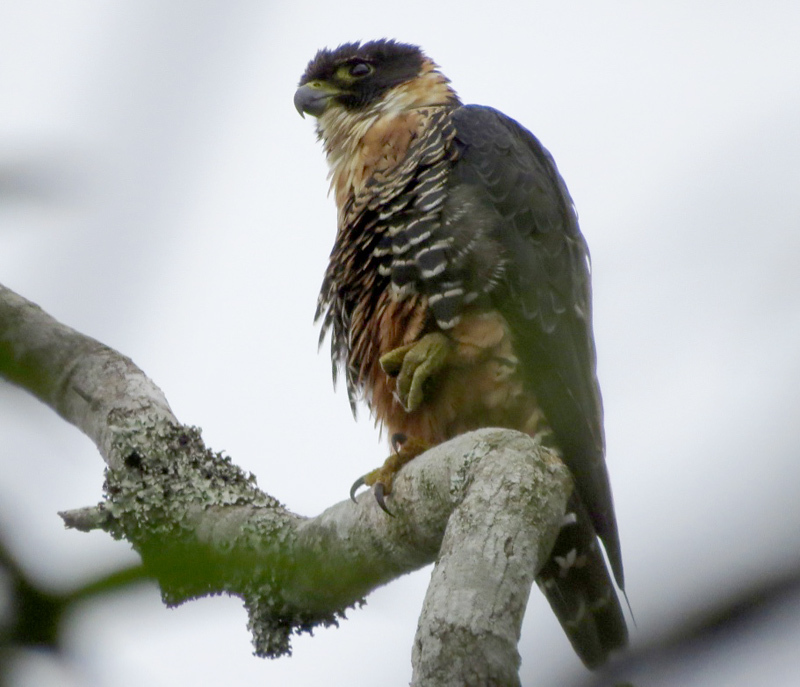 Guilherme Serpa informs us that this is only the second sighting of Orange-breasted Falcon for Rio de Janeiro state – an incredible record! Intriguingly, Adilei has seen a falcon here in the past that he assumed was Bat Falcon and Nicholas has photographs of a falcon taken nearby on Pico da Caledônia, again presumed Bat Falcon at the time. We will be checking these photos to double check the identification. The following day another group from the lodge visiting Pico da Caledônia failed to relocate the bird, but hopefully it will be seen again. Very well done to David Wilcove for an excellent state find and for taking an excellent set of photographs. We are well into the austral spring and the weather in October has been rather mixed, with hot temperatures much rainfall, including a couple of days of full rain. Many bird species have now moved to higher, cooler elevations for the spring and summer, whilst activity around the wetland and lodge garden is increasing as more species are breeding. The undoubted highlight of the month was finding Rio de Janeiro’s first Andean Flamingo on one of our excursions to Cabo Frio. On the reserve, the wetland continues to provide excellent birding opportunities with an amazing four Sungrebe now being reported – surely a record count for Rio de Janeiro state? Also at the wetland, Boat-billed Heron, Greenish Eleania (very scarce in Rio de Janeiro state), Uniform Crake, Russet-crowned Crake, Rufous-sided Crake, Pauraque and Red-cowled Cardinal (scarce at the wetland nowadays). 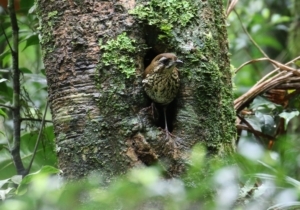 The adjacent Brown Trail continues to bring in yet more forest interior species, with White-bibbed Antbird and Scaled Antbird making appearances, along with the more usual Sooretama Slaty-Antshrike and Tawny-browed Owl. Highlights on the Green Trail include Shrike-like Cotinga, Temminck’s Seedeater, White-necked Hawk, Black Hawk-Eagle, Pin-tailed Manakin, Crescent-chested Puffbird, Southern Antpipit, Saw-billed Hermit, Spot-billed Toucanet, Bare-throated Bellbird, Rufous-capped Motmot and Rufous-capped Antthrush. On the Grey Trail another of REGUA’s specialities, Russet-winged Spadebill, was seen along with Salvadori’s Antwren, Buff-bellied Puffbird and Least Pygmy-Owl, On the 4×4 Trail the very rarely encountered Tufted Antshrike was heard but not seen, and nearby a Bare-throated Bellbird seen on the area planted two years ago near the Guapiaçu river. 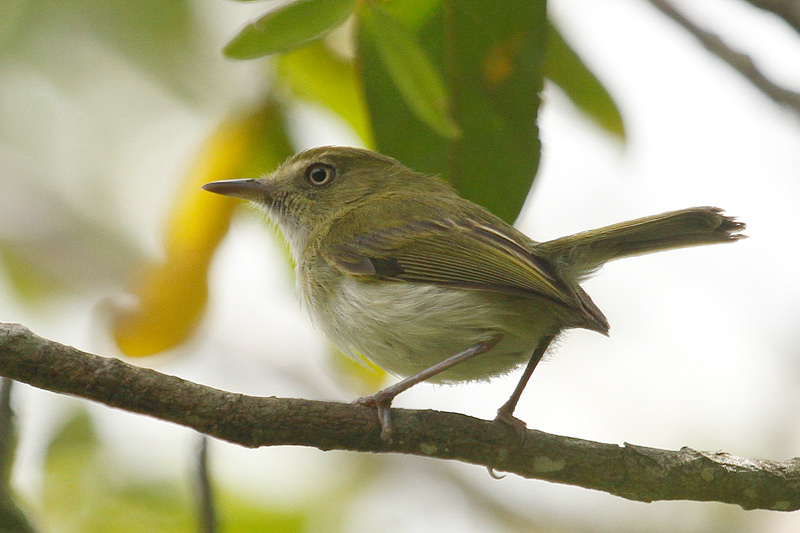 At the other end of the reserve on the Waldenoor Trail, another Tufted Antshrike was heard, as was Salvadori’s Antwren, but 2 male Frilled Coquette, Yellow-fronted Woodpecker, White-throated Woodcreeper and Spot-billed Toucanet were amongst the birds seen. On our night excursions, Giant Snipe, Scissor-tailed Nightjar, South American Snipe, Ash-throated Crake, Streamer-tailed Tyrant and White Woodpecker were all seen. Excursions offsite have been equally popular and productive. Cabo Frio and its rare coastal restinga habitat produced Restinga Antwren, Roseate Spoonbill, American Oystercatcher, Hudsonian Whimbrel, Greater Yellowlegs, Lesser Yellowlegs, Hangnest Tody-Tyrant, Lemon-chested Greenlet and of course, the Andean Flamingo. Our trips to the Atlantic Forest mountains produced a good number of high altitude Atlantic Forest endemics. Pico da Caledônia produced great views of the extremely rare Grey-winged Cotinga, nesting Swallow-tailed Cotinga, a female Chestnut-headed Tanager (rare on the coastal slope), Large-tailed Antshrike, Dusky-tailed Antbird, Rufous-tailed Antbird, Yellow-browed Woodpecker, Plovercrest, White-throated Hummingbird, Sharp-tailed Streamcreeper, Sharp-billed Treehunter, Black-billed Scythebill , Shear-tailed Grey Tyrant, Saffron-crested Tyrant-Manakin, Diademed Tanager, Bay-chested Warbling-Finch and Cinnamon Tanager. 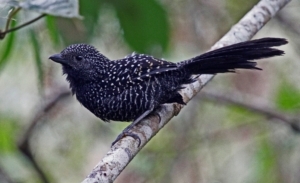 While at Macaé de Cima, Black-and-gold Cotinga, Bertoni’s Antbird, Giant Anshrike were among the species noted. On our excursions to the remnants of the Dry Atlantic Forest around Sumidouro we found the highly sought-after Three-toed Jacamar, as well as other open-country species including Blue-winged Macaw, Magpie Tanager, Serra Antwren, Half-collared Sparrow, Sooty Tyrannulet, Firewood-gatherer, Hangnest Tody-Tyrant, Masked Yellowthroat, Ultramarine Grosbeak, Sapphire-spangled Emerald, Plumbeous Kite and White-tailed Hawk. Finally a belated sighting from September – a Swallow-tailed Cotinga on the Waterfall Trail! 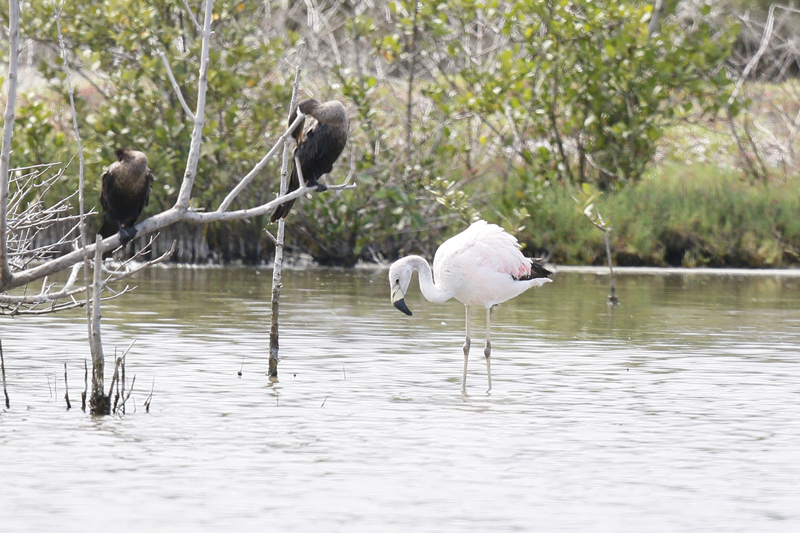 Andean Flamingo at Cabo Frio – a first for RJ state! The sharp-eyed among you will have noticed that our news post about a Chilean Flamingo Phoenicopterus chilensis seen at Cabo Frio on 16 October has been removed. Well, there is an exciting reason for this – the bird has been correctly re-identified as an Andean Flamingo Phoenicoparrus andinus, and the first record for Rio de Janeiro state! Initially thought to be a Chilean Flamingo, thankfully Alan Martin was able to take a few photos and it was only after subsequently checking the photos a few days later that the true identity of the bird became clear. News of the bird was put out and a major twitch (in Brazilian terms) ensewed, with several local birders making the trip to Cabo Frio to see it. It was still present on 6 November and photos from many photographers can be seen on WikiAves. Andean Flamingo is the scarcest flamingo species, mostly restricted to the salt lakes of the altiplano of southern Peru, Bolivia, northern Chile and north-west Argentina. 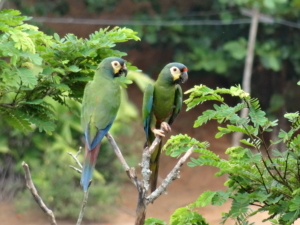 They are altitudinal migrants, moving to lower elevations for the winter, and vagrants have made as far as Buenos Aires province in Argentina, the Brazilian Amazon, and Brazil’s southern coast, where flocks of up to 32 individuals together have been found. The Cabo Frio bird is by far the most easterly occurrence of this species. Very well done to Alan Martin and the Limosa birding group for finding and photographing the bird, and to Gabriel Mello for re-identifying the bird. REGUA is looking at offering a slightly different off-reserve excursion to its lodge visitors in the future. Specialities of another rare Atlantic Forest habitat – mangroves. The mangroves at the back of the Guanabara Bay are quite inaccessible unless one organises a small boat to negotiate the straightened channels. Led by the birding twins, Daniel and Gabriel Mello, members of the Rio de Janeiro Bird Club (COA) converged on the quay at seven in the morning to board three boats and search for species known specifically from this habitat. Along the way we soon found many common species including Roseate Spoonbill Platalea ajaja, Cocoi Heron Ardea cocoi, a lone Harris Hawk Parabuteo unicinctus, Ringed Kingfisher Megaceryle torquata, Little Blue Heron Egretta caerulea and Snowy Egret Egretta thula. Alighting to explore some marshy areas, we soon found the target birds of the trip – Crested Doradito Pseudocolopteryx sclateri, Spectacled Tyrant Hymenops perspicillatus and Rusty-collared Seedeater Sporophila collaris. Crested Doradito is a fairly widespread species but difficult to see as it is restricted to marshy inaccessible areas. Spectacled Tyrant is known mainly from the south of Brazil but migrates to Rio de Janeiro for the winter, so we were all very pleased to see it. 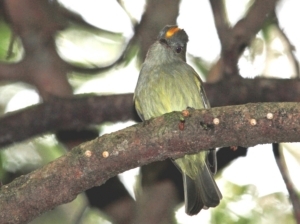 Rusty-collared Seedeater is fairly widespread along the Atlantic Forest but is difficult to see at REGUA. The excellent views and interesting habitat make it an ideal trip for visitors and REGUA is excited to be able to offer this new trip in the near future.